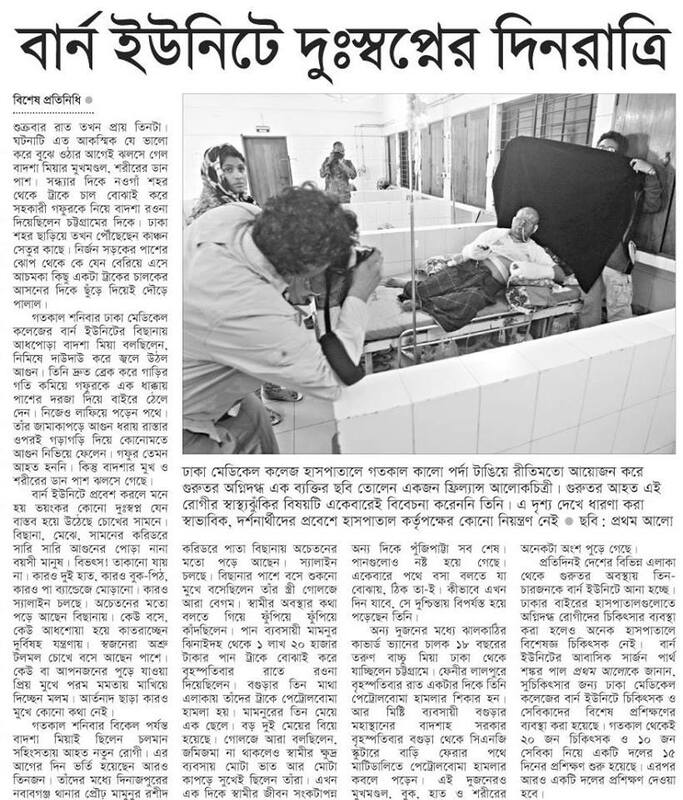 A photojournalist’s style of working inside the burn unit of DMCH has stirred up severe debate in the photojournalist community. Freelance photojournalist Saiful Huq Omi used an assistant to hold a black backdrop to create portraitures of victims of petrol bomb attacks who are under treatment inside the High Dependency Unit (HDU) ward of burn and plastic surgery institute of Dhaka Medical College Hospital (DMCH). He was challenged by fellow photojournalists who were also working in the same unit. He was made to discontinue his work and leave. Later a storm of debate started on social media. Photographs of Omi in action were even published in leading national daily newspapers criticising the insensitivity of the journalist. Allison Joyce, an American photojournalist working in Bangladesh, questioned the criticism from Bangladeshi photojournalists who themselves have captured and published images of victims at the burn unit, then why are they being hypocritical about Omi’s work. I personally know that some of the newspapers that carried images of victims in the burn unit on their front page, usually have a policy against using graphic images. Yet these images have been carried in the past couple of weeks on front pages of daily newspapers. I believe this has been done as the sickness of hurling petrol bombs is continuing mercilessly. Therefore in the context of newspapers, these images have justification, as because they carry ‘news value’ to make the public aware of what is going on. Another jargon would be ‘public interest’. Whereas Omi’s project is very different, it is not news. He is working on a series of staged portraiture of victims. Therefore his work does not have the same justification. Yet there is absolutely nothing wrong with his style. But the trouble in my opinion, and of others’, is Omi’s choice of time and space. In a facebook status message Omi tried to defend his action by mentioning that he did mot move the patients or ask them to change posture. He only held a black backdrop to intensify the visual of suffering by the patients. He also clarified that he took permission of each individual and their attendants. He confidently expressed in this message that he is clear in concept and conscience of what he was doing. Sadly Omi fails to realise that taking staged portraits holding backdrop behind the patients while they are in severe trauma is grotesquely bad decision. It stretches ethical and moral boundaries. It’s like wearing a red dress to a funeral. My observation is that most people who are looking at the photos (on facebook, and a number of leading national daily newspapers) showing how Omi worked inside the burn unit of the hospital, are disgusted by it. I am sure these same people would feel disgusted to see the other unethical and immoral practices fellow journalists come up with in the race for a story. I would be critical of each and every unethical and immoral act, including my own. Albeit some people are also using this opportunity to give Omi the mob treatment, which is clearly evident on facebook comment threads, and different adda’s. I am not in favour of this behaviour. In my opinion we should all, press photojournalists and freelancers, be more sensitive when covering disaster. We easily cross lines, specially in a place like Bangladesh, where the public and the administration are very accommodating towards us. We are hardly ever challenged. This is a hard-earned freedom our predecessors have gifted us to enjoy and practice. Therefore we must act more responsibly. Dhaka Medical College Hospital is not the most hygienic place. But that does not stop us to do our part. Procedures should duly be followed when we go on assignments. The photojournalist community in Dhaka can decide to set example when entering the burn unit by wearing appropriate protective covers on top of our clothing, wearing masks and head covers, so as to protect the patients from risk of infection. Some may think this silly, but hospitals around the world would not allow anyone without this gear inside these wards. Omi is part of a group called CounterFoto. This group has launched a photography school a couple of years ago by the same name, where Omi is a teacher. I urge CounterFoto to grab this opportunity to bring forth these issues of ethical and moral boundaries in photojournalism, in their classroom discussion, as well as maybe by hosting discussion forums calling upon the photojournalist community. Zaid Islam is a photo journalist of The Independent. This article is reprinted with permission from The Independent and the author. Editor’s Note: Saiful Huq Omi’s interview is here. Previous Ekush, are you blood rose of Senegal?